In the past few weeks I've been asked a lot of questions as we approach the signature event launch of IBM Mail Next this week on November 18th. The key to understanding IBM Mail Next is very simple; Mail.Next is NOT a new mail client, Mail.Next is a new way of working! 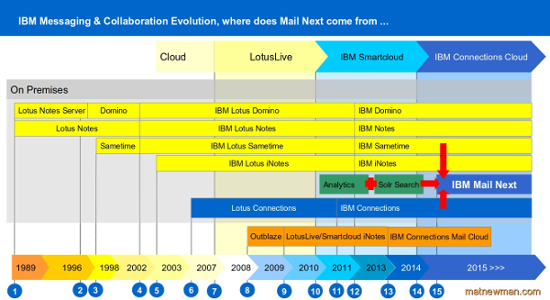 So where does IBM Mail Next come from? I've put together the following infographic that I've been using in discussions with customers to enable them to understand the history behind this vision. 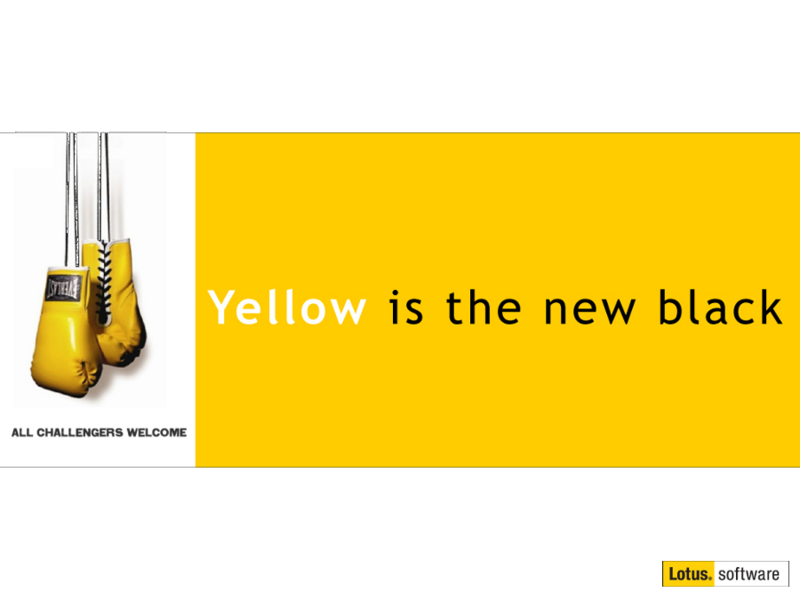 To recognise the expanding capabilities of the Lotus Notes Server with it's ability to host applications accessed by a growing number of clients and protocols, Lotus rename the server component "Lotus Domino". The first version of Notes/Domino and Sametime to officially carry the IBM brand "IBM Lotus Notes", "IBM Lotus Domino" and "IBM Lotus Sametime"
IBM launches Lotus Connections, an enterprise social platform that would begin to dramatically transform interaction and communication within the enterprise. Outblaze is incorporated into LotusLive and offered as "LotusLive iNotes" as an entry level cloud based messaging system which should not to be confused with Domino based iNotes, which on IBM's cloud is called "Notes Web Access"
IBM begins removing individual 'brand' names from all of it's offerings, releasing IBM Notes, IBM iNotes and IBM Domino, version 9: "Social Edition" signifying the closer integration of IBM's Messaging & Collaboration and Social Business platforms. The convergence of Messaging & Collaboration and Enterprise Social platforms, backed by powerful Analytics capabilities, and tightly integrated Search, IBM's Mail.Next interface is released for General Availability. What this history demonstrates is an evolution of capabilities, beginning with the software that revolutionised the messaging and collaboration space in Notes/Domino, the inclusion of realtime voice/video/meeting capabilities with Sametime, the extension of those features to the browser with (Domino based) iNotes, the introduction of a new more productive method of sharing information through an enterprise social platform in Connections, the importance of locating and analysing all of that collective intelligence and finally, bringing all of those capabilities together with a #NewWayToWork which is the vision for IBM Mail.Next. It's an exciting time within IBM as we realise and implement one of our core values: Innovation that matters - for our company and for the world. And of course, these capabilities are all built on your existing foundation of IBM's legendary Notes/Domino portfolio, which has meant an upgrade and an enhancement of capabilities, and no data migration, not once, not in 25 years! Investment protection is one of the hallmarks of the platform. I look forward to discussing these developments with you as they unfold. I recall the project with name "IBM Project Volcan" in 2012, which later transformed into a set of pieces: Activity Streams in Connections, Embedded Experience in both Notes and Connections as well as "Share" button, which you to choose form single dialog where your update should go to: email, blog or status update. The whole story was about working with all incoming data including email. Does it have any relation to MailNext/ IBM Verse ? This is very interesting, and I think, telling. IBM needs to STOP rebranding every product they have. Rebranding a product does not mean that automagically it has changed its functionality. MOST of what you lay out above is rebranding for rebranding sake, IMHO. I can't recall the exact case, but at times IBM has changed product name A to name B and then back to a version of A. What a waste of resources that only serves to dilute their marketing message and confuse customers. IBM needs to STOP "reinventing" email or the way I work or how we communicate, how I live my left, etc. I am down in the trenches every day trying to make Lotus Notes work for users. My users and myself would appreciate less reinventing and rebranding and more bug fixing, UI fixes and improvements, stability improvements, etc etc etc.